In the book they include 144 ideas for fun family traditions. From homemade gifts to quick and easy dinners and desserts. This book is packed with so many fun things. I love that it shows that the holidays aren’t just about the gifts, but it is also about cooking for our family, sanity saving Christmas tips, and even shows ways we can give back. It gave our family so many fun new traditions to try and bring the excitement of Christmas to our house! They also include 12 Quick and Easy Family Dinners. It is so important for our family to eat dinner together every night but sometimes difficult with the busyness of the holidays. This is why I especially LOVE my slow cooker. 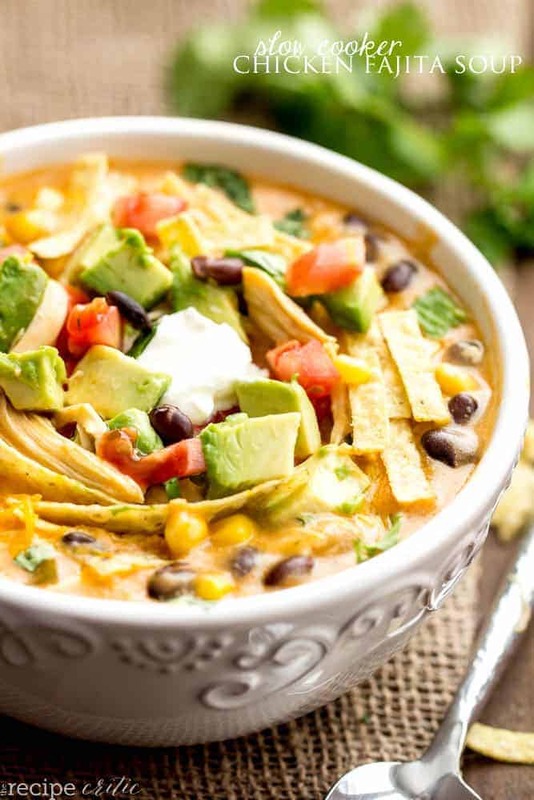 This Chicken Fajita Soup only took a total of 5 minutes to throw into the slow cooker. It was able to cook all day and we had a creamy and delicious soup that was ready for dinner. It is made with minimal ingredients but was packed with amazing flavor. 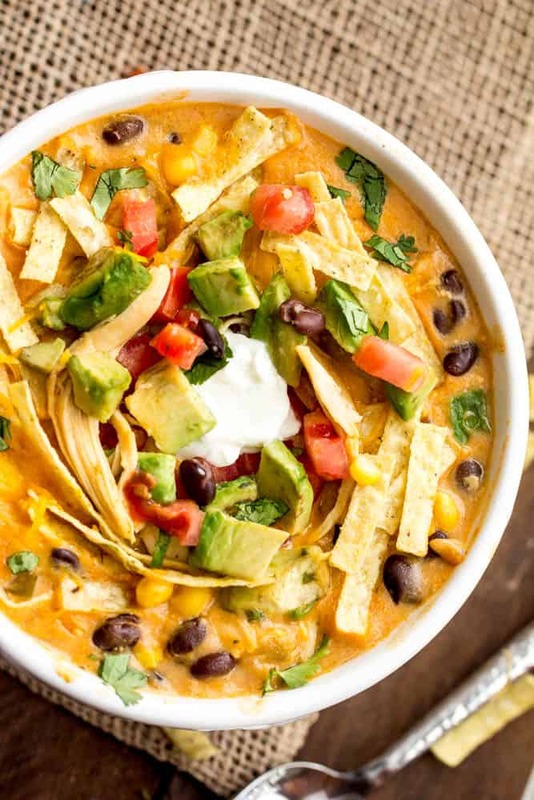 We topped it with cheese and all of our favorite toppings and this soup became an instant favorite. My family all agreed that it was one of the best soups that we have had! I am so glad that I have this cookbook because we will make this soup over and over again. I know that it will become a family favorite at your house as well! A delicious and easy soup that takes 5 minutes to throw into the crockpot and you have an amazing flavor packed soup ready for dinner! You can buy the 12 days of Christmas with Six Sisters’ Stuff HERE! Is the chicken RAW when you put it in there? Yes. It will cook in the crockpot. This was absolutely wonderful!! I doubled the recipe and used the homemade cream of chicken recipe and used homemade chicken stock in place of the water. This will now be one of my go to soup recipes so thank you!! This was fantastic! I added a small can of green chilies and a chopped roasted red pepper (because I love them – not because something was missing) and it was a big hit with the family. I can’t wait to explore your site and find more great new recipes. I added green chilies too. They make all my southwest dishes delicious! I made this for my roommates and we LOVED IT. Super easy and delicious. Do you happen to know the nutrition facts? you lost me at the canned soup. why, oh why? This is a terrific soup; my family loved it! I used your homemade Cream of Chicken Soup and some homemade salsa. The soup tastes great topped with crushed tortilla chips. Thank you! It’s not often that I find a recipe that EVERYONE loves! This one did the trick…thank you! This recipe is great! I always overdo things when it comes to slow cooker recipes so when I made it last week for my family of 4 (a 3 year old son who loves everything but only eats a little, and a 1 year old daughter who is a little picky but eats twice as much as the oldest), I added an additional can of soup and used 4 chicken breasts. It was amazing and we are having the frozen leftovers today over pasta instead of tortilla chips. I will definitely be frequenting your website often! PERFECTION! Absolutely wonderful! Love, Love, Love this soup! I used “two” cans of black beans and a smidgen more corn.Topped w/diced tomotoes, green onions, avacado, & sour cream. Has anyone tried cooking it on High for 2-3 hours instead? i made this for tonight’s Christmas Day dinner. I had two large crockpots of soup beef vegetable and this recipe. This soup was the first to disappear. I would definitely make this again. Even my grandkids loved it. Thanks for sharing such an easy and delicious recipe. Is there a way to make this without canes condensed soup? I would like to keep my food MSG free. I have a 6qt. slow cooker. This recipe doesn’t make a lot so I’m wondering if my cooker would be too big. I would love to try this soup so any input would be appreciated. Thank you! I used a 5 quart. You could use the 6 but you might have to reduce the cooking time a bit. The bigger it is the faster it can tend to cook. Can you freeze the soup and reheat it later? There is only two of us, so I know we will have a lot of leftovers. I can’t wait to try it! It’s in the crockpot now! Just a few more hours to go! Oh no!!! I got ahead of myself and added all the ingredients including the cheese. Dang it! Well… We’ll find out soon whether it works or not because it’s too late to separate. I was a little skeptical trying this recipe – it seemed too simple to be good! But this was a huge pleaser for my family. So delicious! I’ll definitely be making this again. I made this for dinner tonight. It was delicious!!! So happy to find simple recipes that taste yummy. Perfect for a rainy day. Thank you!! Would canned corn work instead of frozen? Trying to use what we have in the pantry. I’ve only ever used canned corn and it works totally fine. Loved this recipe! Cooked on high for three hours, subbed canned corn for frozen and used mexican blend cheese rather than cheddar. Also added a can of diced tomatoes with green chilis. Such a hit, thanks for another wonderful recipe alyssa! This was a huge hit! It was so easy to throw together and it ended up being absolutely delicious! My kids loved it. I served it with some cubed avocado, chives and sour cream. I can’t say enough about this recipe!! This was a hit with my family. It was super easy to throw together and it turned out perfectly. I served it with chopped avocado, chives and sour cream. Yum!! How do you convert this slow cooker recipe to stove top?? I’ve made this multiple times, it’s one of our favorites. The only recommendation I would make is after you eat the first bowl you’ll want another but don’t do it you’ll regret it. Its very filling. We have also tried it with rotel tomatoes to give it extra kick. Super yummy! Thank u ? Such a great picture! may i use it in a little cook book im making? with giving you proper credit? Can’t eat salsa, what should I replace it with?? Any ideas??? I got so excited to make this and dumped everything in without spraying the out with cooking spray. Am I in for a mess later on? I threw in some cubes of velveeta cheese but other then that it was amazing!!! What about the tortilla strips can I just cut up some corn tortillas and fry them a bit? This is one of my favorite recipes! It’s easy to make, economical, and delicious! My daughter and I use this as a go-to meal for busy work weeks. Where can I find this type of tortilla strips? What I can find are much wider and longer. I like the idea of thinner and shorter. I logged on my fitness pal with 5 servings, including all ingredients except the additional toppings. How will I need to change this if I’m using rotisserie chicken? This is without toppings and as written. Could bring this down with a reduced fat cheese, home made cream of chicken, etc. This recipe is seriously so good. It’s now a staple at our house and we can’t get enough. The only change I made is I add a can of Rotel and fresh jalapeños. Thanks for the recipe! This is one of my all time favorite slow cooker recipes to date. I make this recipe at least every other month and more in the winter months. Love it so much. This recipe was AMAZING and super delicious!! I loved this soup! So heart and flavorful. Do you think I could make it and then freeze it minus the cheese and toppings??? For an extra meal? Can this be made in an Instant Pot? If so, what settings and timing do you use? what size slow cooker do you use for this? I usually use a large slow cooker. I think it is about 8 qt. Enjoy! I made this tonight and it was a hit! So easy and just delicious. I didn’t have black beans so I used kidney beans and I only had one can of cream of chicken soup so I used a can of cream of mushroom….it still turned out amazing! Thank you for sharing this wonderful recipe. Absolutely loved this recipe! We love a spicy kick so next time I think I’ll try adding green chili’s as others have mentioned. I already can’t wait for leftovers for lunch tomorrow! You can always ask your local Mexican restaurant or they are usually found in a grocery store in a smaller bag either by the chips or near the salad isle.